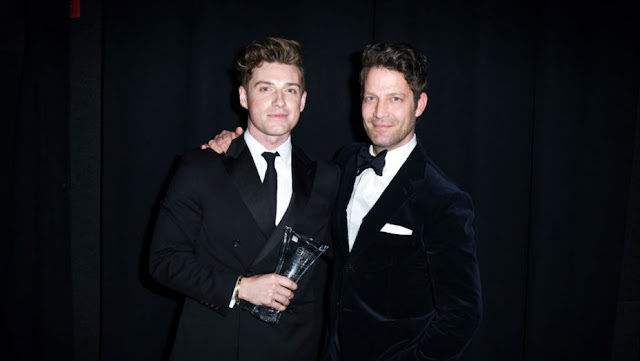 The stars of TLC’s Nate & Jeremiah, were honored by the Family Equality Council at the group’s annual gala over the weekend. The two also told The Hollywood Reporter that they regularly hear from LGBT young people thanking them for their show. “The nicest things that a kid said to us once was, ‘It’s so nice to watch a show where two men could kiss that’s not about two men kissing,’” Brent said. “The normal of our story was the intention behind our show." Hosted by funny man Alec Mapa, the evening raised close to $378, 200 for the Family Equality Council. Olivia Holt presented the Impact Award to Johnson & Johnson for the health and beauty company’s LGBT Care with Pride initiative. I believe it is important for young people to see members of the LGBTQ community on tv as well. I wish I had role models growing up, instead of being made to feel I had to hide being gay like I was a criminal. I am also glad to see Nate Berkus happy in another relationship since I believe he lost his first partner during the tsunami in Sri Lanka.